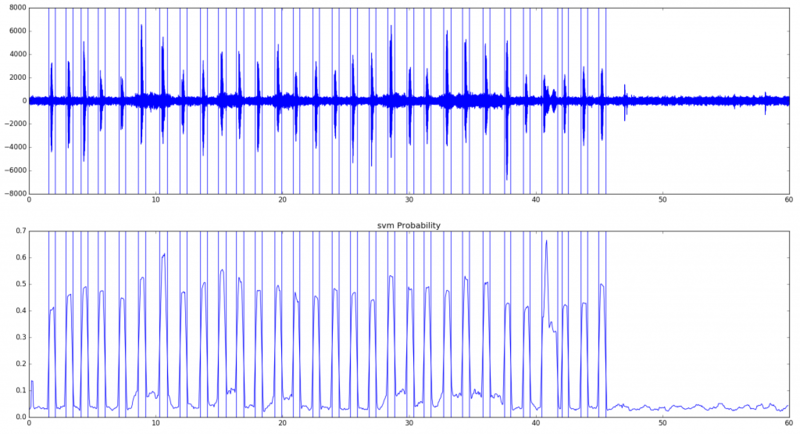 In my previous post I described how to split audio files into chunks using R. This time I wanted to use Python to prepare long audio files (.mp3) for further analysis. The use case would be splitting a long audio file that contains many words/utterances/syllables that need to be then analysed separately, e.g. recorded list of words. The analysis described here was conducted on Linux (Ubuntu 16.04) and it should be fairly similar on MacOS, but Windows would require quite a few ammendments. The first step was to turn the original .m4a files into .mp3 and to extract the segment I was interested in. I used ffmpeg for these tasks. This can be skipped if your files are already clean. The second command created a copy of the original .mp3 file and extracted the segment between 17 min 50 sec and 23 min 30 sec. That’s where speech was recorded in my file. Top row shows the waveform of the audio signal. Y-axis is amplitude, X-axis is time. Bottom row shows the probabily of non-silence, the vertical lines are markers that will be used to split the file. The result is a list of sliced wav files. The names contain timings of the boundaries.